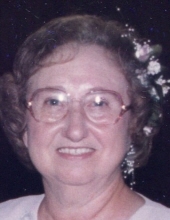 Edna L. Crawford Geswein, 87, passed away Monday, April 8, 2019 at Baptist Health Floyd in New Albany, IN. She was born February 5, 1932 in Floyd County, IN the daughter of Carl and Olivia Mary Rochner Rouck. She was a secretary for the New Albany-Floyd County School System, was a member of VFW Auxilary #1693 in New Albany, she was a member of St. Mary’s Catholic Church in New Albany where she participated in St. Mary’s Altar Society. She was preceded in death by her parents, her husbands, Arthur Crawford and Elmer Geswein, her brother, James Rochner and brother-in-law, Joe Mehling. She is survived by two sisters, Virginia Renn (Robert)of Sellersburg, IN and Joyce Mehling of Georgetown, IN; her stepsons and exchange students that considered her “Mom” and many nieces and nephews, great nieces and nephews and great great nieces and nephews. A Mass of Christian Burial will be at 11 AM Saturday, April 13, 2019 at St. Mary’s Catholic Church in New Albany. Friar Mark Weaver will be the celebrant. Burial will be in Holy Trinity Cemetery in New Albany. Visitation will be held from 2 PM to 8 PM Friday, April 12, 2019 at the Gehlbach & Royse Funeral Home in Georgetown, IN. There will be a rosary on Friday evening at 7 PM at the funeral Home. Her family is asking for donations in lieu of flowers be made to either the American Diabetes Association or to the American Cancer Society. To send flowers or a remembrance gift to the family of Edna L. Crawford Geswein, please visit our Tribute Store. "Email Address" would like to share the life celebration of Edna L. Crawford Geswein. Click on the "link" to go to share a favorite memory or leave a condolence message for the family.